Now we can offer a complete family of Anthropomorphic Test Devices (ATD's) commonly known as Crash Test Dummies for use in the vehicle safety industry with a major emphasis still on the automotive markets but again expanding into the fields of aerospace, aviation, biomechanics and various segments of science and research. All of the various Anthropomorphic Test Devices available are tested and certified to regulatory specifications and safety standard guidelines and they are fully instrumented with calibrated precision load cell devices. Consists of a 3-year-old, 6-year-old, 10-year-old, small adult female, mid-sized adult male and large sized adult male. 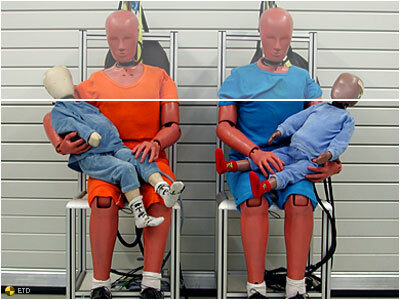 These dummies are all designed for use in (FIT) - frontal impact testing of automotive restraint systems. The 3-year-old, 6-year-old, small female and mid-sized male are also specified for (FIC) - frontal impact compliance testing. The first SID was developed in the 1970s for the NHTSA. SID, a Hybrid II-type dummy with an adapted thorax, is the official dummy used in government-required side-impact testing of new cars. These dummies primarily measure injury risk to the head, chest and pelvis. These were created by the Occupant Safety Research Partnership of USCAR, an U.S. consortium. SID II's represents a small female who is 5 feet tall and 110 pounds, and is a scaled-down version of BioSID. This dummy is based on a torso design by General Motor's researchers, in collaboration with the SAE Company. It has more sensors and a more biofidelic (human-oid) body than a SID/Hybrid III, thus allowing engineers a better assessment of the risk of injury to internal organs. It utilises a Hybrid III's head, neck and legs and is instrumented to assess the potential for head, neck, shoulder, abdominal, thoracic, pelvic and leg injuries. These are mid-sized male dummies being developed in Europe for assessing the potential for "whiplash"-type neck complaints in low-speed rear-end impacts. The European Experimental Vehicles Committee developed this variation of SID in the mid-1980s, and is used to determine compliance with side-impact requirements within Europe. An updated version is called EuroSID-2. For testing restraint system effectiveness in frontal crashes, Europe uses the Hybrid III dummy. As the auto industry becomes more global, this ongoing worldwide effort, led by the International Standard-isation Organisation, aims to develop a harmonised side-impact dummy that will be useable throughout the world. The Child Restraint Air Bag Interaction dummy is used to evaluate air bag exposure to infants restrained in child safety seats that are placed in the front seat. CRABI dummies come in three sizes: six-month-old, 12-month-old and 18-month-old. Cannot find what you are looking for? Please contact us for assistance. We also offer the following additional services. This includes maintenance, training and technical support for crash test dummies, load cells, accelerometers and other dummy laboratory calibration equipment. Complete unit calibration, repair and systems integration is included.